Sunflower Food Galore: Why nobody likes pineapple upside down cake anymore? Why nobody likes pineapple upside down cake anymore? Most of the time when people ask for a classic English cake it is always a Victoria sponge. Numerous versions had been published at least few times a year in those glossy food magazines. But why haven’t I seen many pineapple upside down cakes. It is easy and very pretty, much healthier than slathering a cake with large amount of fresh cream. I love this cake, so easy to make. 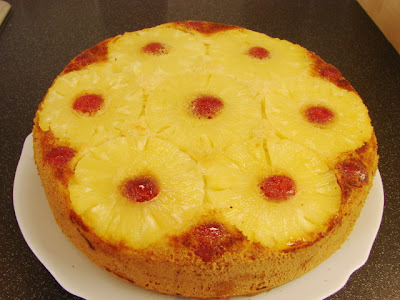 For this recipe, I used a 23cm cake tin, lined with paper then arrange the pineapple slices and cherries on the bottom then whip up a cake mix with 4 large eggs, 8 oz of butter, 8 oz of sugar, 9 oz of S R flour, 1/2 tsp of baking powder and a little vanilla essence. Spread the mix on the fruits. Bake for around 1 hour or till done at 165 deg C fan oven. When done leave to cool,invert the cake and remove paper, brush the fruits with pineapple jam or golden syrup then put under the grill very quickly just to give the cake a nice colour. I would love to know if anyone still makes this regularly. It's pretty retro, but I quite like it - I've made one in the last 6 months. I have also made one in the last 6 months but a slightly jazzed up version froalling Cloudberries' that has cinnamon and other spices in it.